County jails are the gateway to the corrections system and are the form of incarceration that impacts the greatest number of Americans-including those who are never ultimately convicted or sentenced to confinement. Harris County, Texas operates one of the five largest county jails in the nation. County jails are the gateway to the corrections system and are the form of incarceration that impacts the greatest number of Americans-including those who are never ultimately convicted or sentenced to confinement. Harris County, Texas operates one of the five largest county jails in the nation. However, a long term plan is not in place to alleviate the issue of operating above the design capacity by utilizing variance beds and additional staff. This book collects transcripts of an important day-long event sponsored by the Texas Public Policy Foundation's Center for Effective Justice along with the Texas-based John and Laura Arnold Foundation. 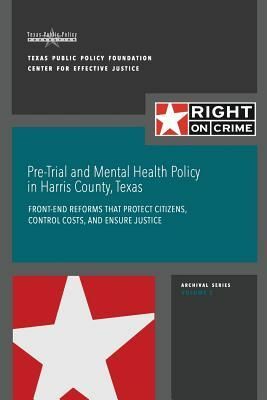 The conference brought together experts from across the country to discuss pre-trial and mental health solutions for not only Harris County, but also Texas, and the nation.